Instantly reset Windows login password with this software! The Windows Password Recovery tool called “PassMoz LabWin” is easy and fast to use for anyone who has forgotten the Windows password on their computer. It is compatible with any PC running Windows Vista, XP, 7, 8, or 10. The tool will let you reset the login password on your Windows Computer within just a few short minutes. This award-winning program has a simple interface which any novice can figure out how to use. It lets you reset your Windows password in 4 different ways. Best of all, none of the information on your computer will be damaged or altered. 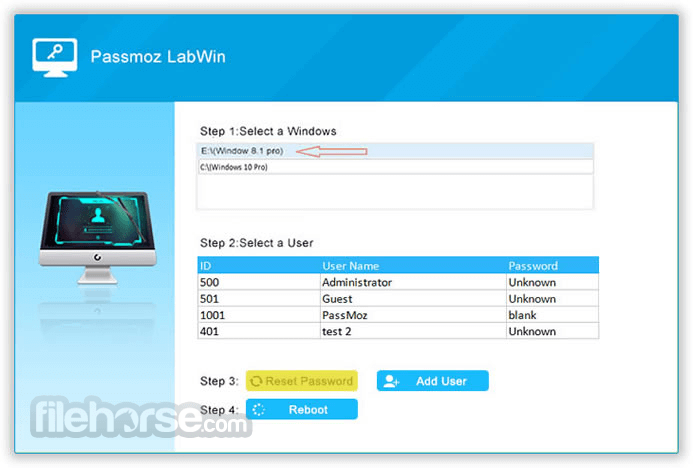 PassMoz LabWin can be used on multiple Windows computers too. PassMoz LabWin is a unique Windows password recovery tool because it already has everything that is needed to reset the password. You do not need to install other tools or input special commands to get this to work. If you know how to move and click with your mouse, then you are good to go. To create a DVD/CD reset disk, the tool will create an embedded ISO image file and then burn it to the disk. Then you will just insert the disk any time you forget your administrator or user password and it will take care of the rest. The software developers of this tool understand the importance of testing their creation before releasing it to the open market. When the tool was in its testing stage, the developers sent more than 100 copies of the program to beta users. Their mission was to find any problems or bugs with the tool. After repeatedly modifying the tool based on their feedback, all the reported bugs and glitches have now been fixed. PassMoz LabWin was then tested on numerous computer brands like Gateway, Dell, Toshiba, and Ace. Over 50 brands were tested in total and they all ran this tool successfully. USB Flash Drives are easy to use external storage devices. You just plug them into the USB port of your computer and then you can save files to it or run files from it. With the PassMoz LabWin, you can turn your USB drive into a reset disk. Some brands which tested successfully with this tool included Samsung, SanDisk, Toshiba, and Kingston. DVDs and CDs may seem old-fashioned, but there are millions of people who still use them. PassMoz LabWin lets you burn an embedded IOS image file onto a disk so that you can use it as a password reset disk. Bypass Password on Windows 10, 8, and 10. Recover a Password on Windows 8 that you Forgot. Reset a Password on Windows Vista. Unlock a Password on Windows 10 or 8. Crack the Password on Windows 10, 8, or 7. Reset Password on HP Laptop. Restore Administrator Password on Dell Laptop.